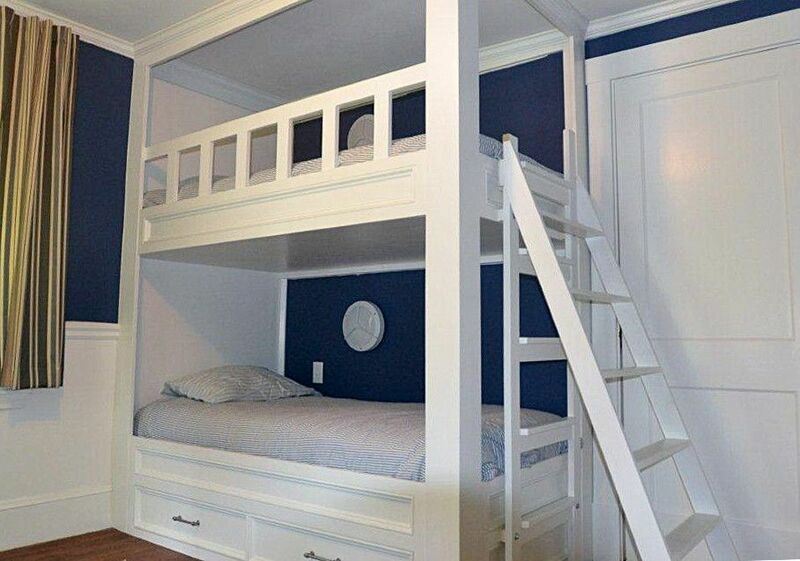 Custom made, built-in bunk beds for boys' room. Client testimonial: "Aaron built a custom fit bunk bed for my boys. We gave him a single photo found on the Internet and he was able to use it to develop a custom design to fit the design of the house and the layout of the room. All of the pieces were custom made and assembled on site. The project was a complete success with no issues whatsoever. The house is 125 years old so the floors are not even close to level. Aaron came prepared and was able to install the bed in a way which was level but still custom fit. The boys have used the bed for over a year and absolutely love it. It is sturdy enough to hold five or six kids on the top bunk. Aaron even included two large "gentle close" drawers in the base of the bottom bunk. These have been very useful for storing sheets, towels, etc. Aaron showed up on time and completed the project in one day having constructed the bed in pieces in advance in his own workshop."